You are here: Home / Jewelry / Store profile: The Antique Guild, part II. Store profile: The Antique Guild, part II. As promised, here are the rest of the pretties from my visit to the palace of wonders that is that fabulous Old Town Alexandria store, The Antique Guild. To recap, I visited The Antique Guild and its lovely owner, Mara, a few weeks ago and fell in love with it. I stayed for so long and took so many photos of the beautiful jewelry that I couldn’t fit it all on post. Here’s a link to Part I, if you need to catch up. Today, I bring you part II of The Antique Guild’s treasures. This gold Art Nouveau pendant in the shape of a dragon is one of the coolest things I’ve ever touched with my own hand. That thing was heavy – serious gold. But what was remarkable was the level of detail: the feathers of the dragon’s wings are detailed even on the back of the piece. Here’s a detail shot of the dragon pendant’s face. You can see its eyes, its tongue, the straining of its neck muscles as it holds onto that diamond in its mouth. My inner fantasy nerd (which isn’t really very “inner”) was delirious with glee. An extraordinarily fabulous Art Deco diamond shield ring. You should have seen this one sparkle in the sunlight, it was out of control. I fell hard for this insanely cool antique lion-headed bracelet. Gold with diamonds and rubies. This is one of the pieces that Mara brought out of the safe for me to play with. Insanely beautiful Art Deco diamond and ruby filigree pendant. How tiny and perfect is that filigree? Here’s a friend for that lion I showed you earlier: this one’s a gold locket, also with ruby eyes and a diamond in his mouth. Look at the detail of the fur texture on its face. A vibrant and colorful (if slightly blurry – my apologies) Art Nouveau brooch. Amethyst, enamel, and pearls. I thought these two Art Deco marcasite monogram brooches were just too cool. I was surprised how much I liked this heavy gold ring from the 1960’s with its funky emerald and diamond design. Not my usual style, but I loved it as soon as I put it on. Here’s a handful of garnet bangles that caught my eye. The two on the far right are a set; they’re meant to be worn with one on each wrist. 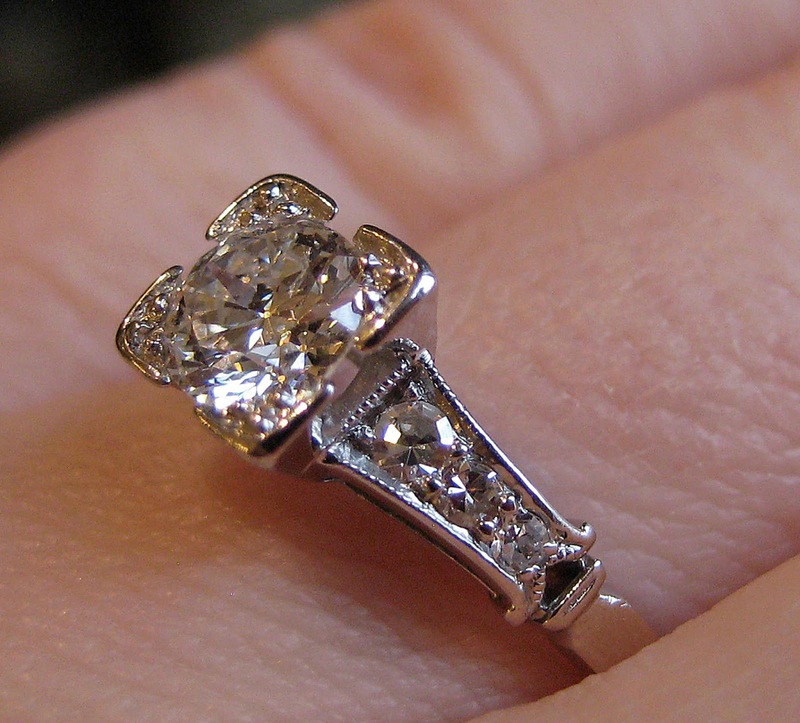 I thought this 1940’s diamond engagement ring looked pretty good on my hand. This guy right here is solely responsible for my newly found desire to own an antique slide bracelet. Want more info on The Antique Guild, or want to revisit the first batch of photos? You can find The Antique Guild store profile Part I here. A huge thanks to Mara at The Antique Guild and her lovely associates for not only putting up with me for five hours, but welcoming me enthusiastically and making me impatient to return.